Varenyky (Perogy, Pierogy) lovers will agree that you don’t have to wait for any special occasion to crave these delicious dumplings, so anytime is the right time to have them. 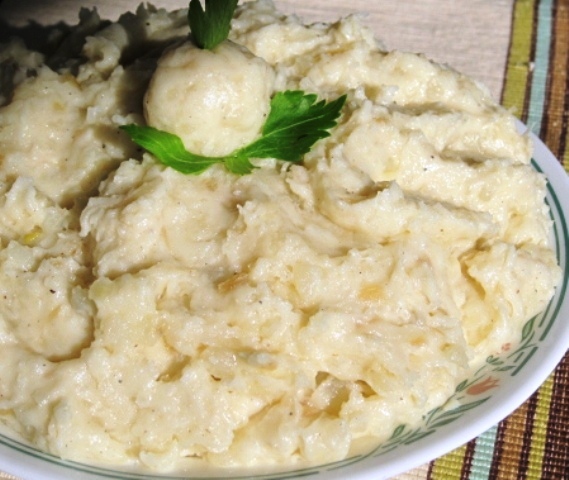 With Christmas Eve just around the corner, many Eastern Europeans will be making varenyky (pierogy, perogy) for their Christmas Eve 12 course meatless meal. Making them from scratch is an involved process, but totally worth the effort, since all the manufactured ones don’t stand a chance when compared to the real stuff….you will agree if you tasted them both. I already posted very detailed step by step directions (click this link) for making the dough and making the varenyky. Many of you have asked about the different fillings one may use to fill these dumplings. You can basically use anything you like as a filling, even meat, or seafood, but I will post few of the more traditional ones. Potato and Cheese filling for varenyky (click on this link, then scroll down towards the bottom of that post for the list of ingredients and directions). This is the most popular filling of all, and loved by everyone. Farmer Cheese filling for varenyky. Use at least 1 lbs. of farmer cheese (I love the Friendship brand, which is easily found at Wegmans supermarket, but I also found it locally at Shop Rite grocery store). I tried “farmer cheese” from at a Dutch Market, but it was kind of grainy and bitter, so I am sticking with the Friendship brand. 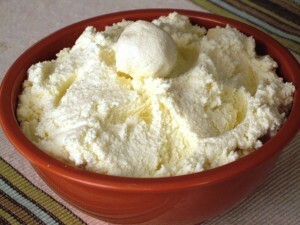 Using a mixer or food processor, beat it for a minute or so to make it a little creamier. For a savory cheese filling, add one raw egg yolk, a pinch of salt, and ground black pepper, to taste. You can also add some chopped chives to add more flavor to the cheese. If you prefer it on a sweeter side, you can still use the egg yolk, but use sugar instead of salt and pepper, and you can even mix in some raisins, or chopped prunes. Savory Cheese varenyky may be served with tomato sauce, just like ravioli, or with onions sautéed in butter. 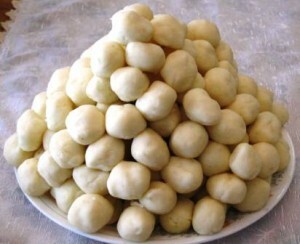 The sweet cheese varenyky may be served with melted butter, or butter and sugar (white or brown). Blueberry filling for varenyky (click on this link to find the ingredients and directions for this filling). Actually, you can use any fruit you like, such as chopped apples, rhubarb, strawberries, strawberries mixed with chopped rhubarb, cherries, plums, etc. Green Cabbage filling for varenyky. My mom used sauerkraut for her varenyky filling, but my mother-in-law taught me how to make the green cabbage filling, and these are my husband’s favorite. He prefers these over the potato ones. 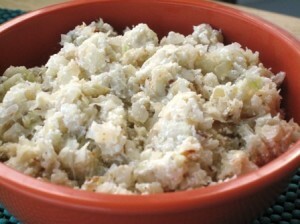 To prepare this filling, remove a couple of the damaged outer cabbage leaves, and discard. Cut the cabbage head into quarters, then chop up coarsely. Add chopped cabbage to salted boiling water, bring back to boil, and cook for 10-15 minutes, stirring occasionally. When the core ends of the cabbage pieces are almost done, drain off the water by pouring it all out into a colander, letting it to cool off. Take a handful of cabbage at a time, and squeeze out as much water as possible, or use cheesecloth for easier handling. Again, take a handful at a time of the squeezed out cabbage, place it on a cutting board, and chop it up fine. You will notice that the chopped cabbage still has lots of moisture, so you need to squeeze it out again, to make it dryer. In a large saucepan saute one chopped onion, until lightly golden, add the chopped cabbage, flavor with salt and pepper, and saute for 10 minutes. Cool off before using for filling. For easier handling, you may mix in 1/4 cup of mashed potatoes, but it is not necessary. Most cooks add some farmer cheese to cabbage, for additional flavor and easier handling. You apply the same process for sauerkraut, except for cooking it. You rinse out some of the original juices from the kraut, squeeze it out, and place it in a medium pot of cold water, bring it to boil, and cook for 15 minutes. I like to add some salt and a bay leaf while cooking it, and discarding the leaf once done. Then follow the same process as for the green cabbage. Some cooks like to add some sautéed mushrooms to their cabbage, or to the sauerkraut filling. 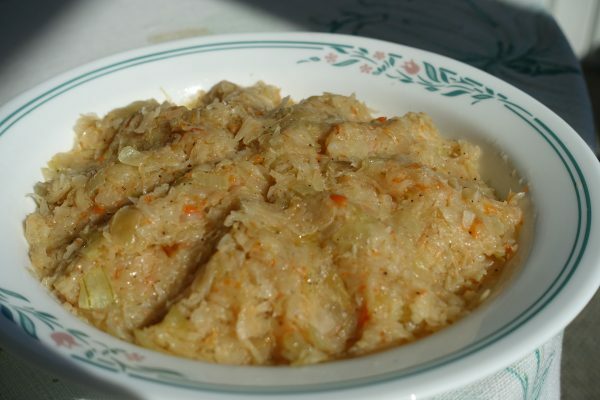 Here is my sauerkraut filling for varenyky, which consists of cooked and drainer sauerkraut, sauteed with onions and shredded carrots. Flavored with pepper and salt. For more details please check out this link. You can also add sauteed mushrooms to this sauerkraut mixture, plus the other ingredients already in there. This is not a very popular filling these days, but it was quite popular in the old country, as farmers used to plant buckwheat, to aid the bees with their honey making, by the abundance of pollen on the fields of blooming buckwheat plants. 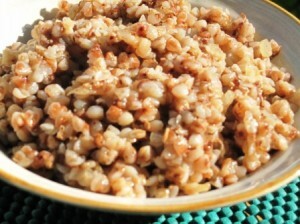 Buckwheat is very healthy to use as a hot cereal, a side dish for breakfast, lunch or dinner, as a filling for cabbage rolls (holubtsi), baked with chopped bacon, or used as a varenyky filling. I am the only one in my family who likes buckwheat, so I don’t make it very often, but I do like it steamed and mixed with sautéed onions. Cabbage rolls filled with steamed buckwheat, flavored with sautéed onions with mushrooms, is a very popular dish for a traditional Ukrainian Christmas Eve meal. Buckwheat can easily be found in a Kosher section of your favorite grocery store, or any European specialty store. Follow the package directions for cooking this grain, but do not overcook, or it will get mushy. Flavor with salt and ground black pepper, and sautéed onions. You can also add sautéed mushrooms, or some farmer cheese, or couple spoons of mashed potatoes, to keep it together, for easier handling during filling. 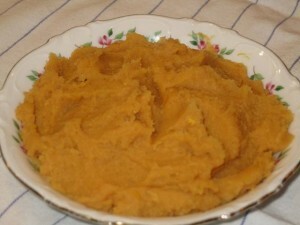 Here is not so traditional varenyky filling out of Sweet Potatoes (Yams). One time I decided to try leftover sweet potatoes as a verenyky filling, and liked it enough to make them more often. Some of our family members like them more than the traditional potato ones. I serve them with melted butter, flavored with brown sugar ( I also add some whipped cream on top of mine…..). To prepare the sweet potato filling, peel couple of yams and cut them up into chunks. 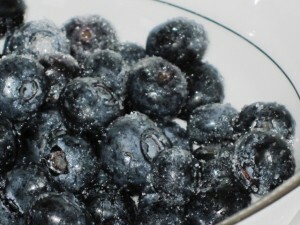 Place them in a medium saucepan, and fill with enough cold water to fully submerge. Bring to boil, and cook until still slightly firm. Do not overcook, or they will be too watery. Drain off water, and keep uncovered to dry off some more. Add some unsalted butter, and some cinnamon (optional). Mash well, so there are no lumps. Cool off before filling. Now you are ready to roll up your sleeves and start making varenyky with your favorite filling. Please let me know which filling is your favorite, or share a recipe of a different filling yet. Thank you! Sensational cabbage and buckwheat fillings. The cabbage (the way your husband likes it) disappeared in no time. Thank you so much for stopping by my blog and leaving a lovely comment. I am glad to hear that you enjoyed the varenyky fillings I posted.